The first three chapters of the Old Testament describe how the Hebrews in that time period, and many people today, believed Earth came to be created. These chapters also describe the creation of the seas, the skies, and the people and animals that would inhabit the creation. 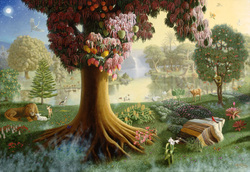 The dark side of this tale of Eden is also included, the "fall" of man, when Eve falls to the temptation of the serpent and in turn leads Adam to a fall from grace as well. According to the chapters, all the generations to come would also suffer due to their sinful actions. See p. 38 in your text for more information. 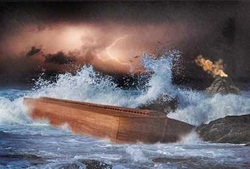 The Biblical book of Genesis contains a flood story familiar to many people. This Biblical account tells of a time when the rain fell for forty days. The rain had been sent in order to wipe out the Earth's population and start ffresh with humanity. On the ark, the stuory texplains that two of every kind of animals were taken. In the end, Noah and his sons and their families were allowed back on the Earth to begin again. Some scholars will say that other ancient texts also contains similar flood stories.